Have you ever found the answer to a question before you knew you were even really thinking about it? When Elbow Room came to an end a lot of people asked what my plans were for the next adventure. I didn’t have an answer at the time and it didn’t occur to me until the other week when the answer came to me that I had even been thinking about it. In the years since founding As Yet Untitled a huge amount as changed. I have new commitments and have grown as an artist. To keep the project that is this wonderful micro press fresh, exciting and relevant As Yet Untitled needed to change with me. Over the last few years, with Elbow Room and Lost in a Dream, I have fallen in love with the live events, with bringing the book off the page and onto a stage. I realised that this is something I want to do more of, that I want to make a central part of what As Yet Untitled does. With that in mind I am starting down a new path with the idea of developing new projects that explore the book and beyond. I am thrilled with this new direction and first project has already begun. I can’t wait to share the journey with you all. The afternoons are dark, the air is cold and the twinkle lights are gorgeous… it must be winter. With winter comes the holiday season, fine food, fires to curl up in front of, gifts to give and time for one last good book of the year. We all know that incredible feeling of falling in love right? Being swept away by the first touch of beauty, tumbling deeper as more is revealed and eventually finding ourselves in a completely new world, a world some part of us now lives in forever. I’m not talking romantic love; I’m talking about the irrevocable process of falling in love with a book. Books are given as gifts around the world, be it in Catalonia for Sant Jordi Day, or in Iceland for Christmas Eve, or even All Hallows Read. Books make the best presents, for others and even for ourselves. It is with that in mind that we at As Yet Untitled are launching our holiday season special… Blind Date with Books. The idea is a simple one: you choose how much you want to spend and we send you one or collection of our books whose value equal what you’ve spent. We will wrap them beautifully for you and send them anywhere you want. The fun part is that you don’t pick which book, we choose for you and we keep it a secret! All our titles, from Elbow Room to Moonrise and Lost in a Dream are included. So why not get a surprise for yourself or give a handmade book to someone you love. Check out our online shop for full details and we hope you will join us in spreading the love of books this holiday season. The final Elbow Room Live was beautiful. And special. And kinda perfect really. I didn’t have any particular expectations going in, I just wanted the chance to stand up on our little stage at The Harrison one last time. Well, I got to do that and a whole lot more. I got to share a night of incredible music and stories and poetry with a room full of friends. Some I’ve known my entire life and who have supported Elbow Room since the idea was born, and many I’ve made along the road of this incredible journey and who came out to celebrate with us. I also got to invite my sister onto the stage to read from her debut novel. Which is undoubtably one of the best moment of my life. That night I said a very particular and special thank you. Sadly the person it was for wasn’t able to make the night and so I want to say it again now. To Zelda Chappel: One of the best things about Elbow Room was meeting you. I can say without hesitation or doubt that Elbow Room would not have grown and become the beautiful thing it is without you. I can also honestly say I would not have fallen in love with poetry the way I did without you. And, as if that wasn’t enough, you have become one of my very best friends. Thank you. Thank you for everything. To everyone who came to our final celebration, and to everyone who has come to one before I would also like to say thank you. And to assure you that while it was the final Elbow Room Live it definitely isn’t the last event I will be putting on! On a grey day in October 2015, I recreated my wall drawing piece ‘Daylight’ at The Gallery on the Corner as a winner of the inaugural Elbow Room Prize. I still remember the mixed feeling of the pressure and excitement when preparing and executing the line drawing for the Live Night. Although Rosie, Zelda and I painted the piece after the exhibition had ended, it was still there beneath the white paint. I won the Elbow Room Prize while trying to settle into a different type of life after graduation with both excitement and anxiety. Winning the Elbow Room Prize was a big motif that pushed me into limbo. After that, I focused on painting on paper and had my first solo showcase in the UK at Imperial College the following year. In summer 2016, I ran a site-specific art project called ‘Stand a Little Out of My Sun’ with a co-artist and good friend Kyung Hwa Shon and the support of the Barbican Arts Group Trust. As part of the project, we made an anthology as a reservoir of the process. I was genuinely inspired by Elbow Room to make a humble anthology. Since then, I have participated in various publications, exhibitions, and projects. I was shortlisted for the 2017 Griffin Art Prize, won the 2018 Window Project of the Gazelli Art House and one of my paintings is currently a finalist in the 2018 Ingram Collection’s Purchase Prize. I have mentioned a few of my proudest experiences as I would like to thank Elbow Room for encouraging me to keep myself on track. I believe that Elbow Room is as meaningful for everyone involved. In front of Elbow Room’s glorious end, I would like to thank Rosie, Zelda and all other contributors who have led this amazing journey this far; I believe that we are celebrating the start of something new. I am still writing and, I hope, becoming more focussed and skilful. I think I must be a bit like fungus though - that most of this development takes place underground! Since my poems were included in Volume 14 of Elbow Room, my work has appeared in print and online publications, as well as being anthologised. One of my poems was The Missouri Review's Poem of the Week and another was long-listed for Dempsey and Windle'sBrian Dempsey Memorial Poetry Competition, but my most important accomplishment was the publication of my debut chapbook, Reasons (for Moving), by Structo in 2017. Getting Reasons (for Moving) published was certainly a learning experience and the lessons included things like: 1. Delays are inevitable. If there's a release date, tack on several months to preserve your sanity. 2. Throwing your own launch party is harder than it sounds, but a sparse turnout can just as easily feel intimate. 3. Promotion is a real challenge, but local open mic nights are decent places to flog your work and meet like-minded people. It was a privilege for me to be featured in Elbow Room alongside established writers, such as George Szirtes, and emerging ones alike. In beautiful hand bound editions, and with thoughtful curation and editing, Rosie and Zelda created space for writing and artwork to flourish. Not only this, but for many writers, including myself, their events were our first paid readings. The generous, warm and professional environment was a standard bearer, influencing many contributors -- such as Lewis Buxton, now running TOAST Poetry -- who have gone on to organize their own events. This massively positive influence will, I hope, continue to be felt. Those of us lucky enough to have been a part of them will remember those evenings, and will treasure our copies of the magazine. Work, play, work, work, sleep. Eat, work, work, repeat, play. Within these brief moments of play, my ‘Dead Woman Walking’ flash fiction (bordering on prose poetry) was published in Elbow Roomearly in 2017 and my photo-poem ‘From each tiny twig’ was one of the postcards produced by Elbow Room as part of the 5th birthday celebrations in 2017. In some ways, my life has since developed on most of these fronts, but in different ways. My poetry pamphlet How to Grow Matches (Against The Grain Press, 2018) was published at the end of March 2018, shortlisted in the International Rubery Book Awards 2018 and ‘His Secret Daughter’ from the pamphlet was Guardian Poem of the Week. Mantle Lane Press also published my first short novella Kaleidoscope in April 2017 and the companion/sequel novella Always Another Twist came out in April 2018. 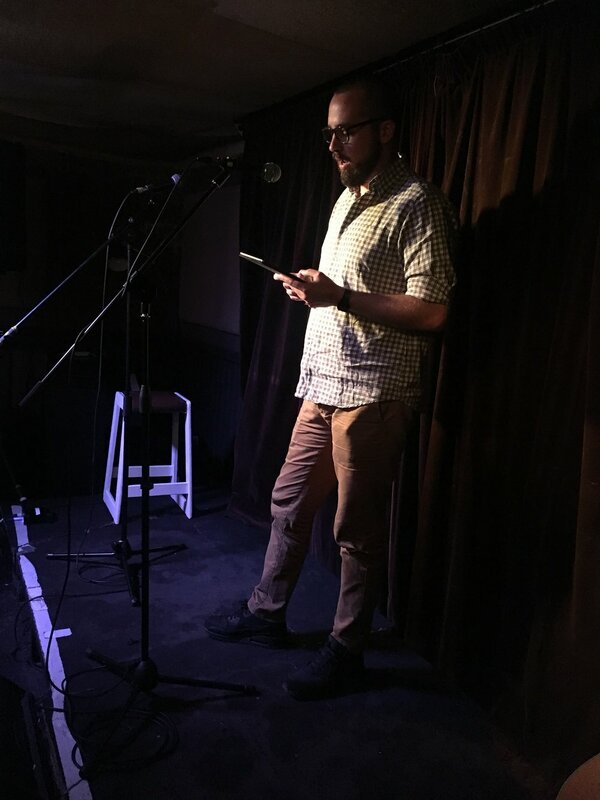 I’ve had other individual poem publications and successes in competitions, which I won’t list here – they’re on my website if people are interested. I also joined the reviewing team at Riggwelter earlier this year. My flashing life has been quieter and less busy. Although I’ve had a number of flash fictions published online since then, my personal writing time has been taken over by writing some creative non-fiction – essays and paid articles. Also, of course, marketing my books. (This actually eats quite a lot of the pie-chart left between work and sleep.) Much though I get self-conscious about the ‘Please buy one, it makes me smile and helps keep the publishers afloat and publishing other people’ side, it is true. And, of course, I also hope readers will like them!!! The other side of this for me is my role as a publisher and editor at V. Press poetry and flash fiction imprint. The press was shortlisted for The Michael Marks Publishers' Award 2017 and individual V. Press titles won or were shortlisted in awards in 2017/2018. I’m extremely proud of all V. Press authors and books!!! I love photography and playing creatively with images, especially combining them with text. Earlier this year I started a small online journal LitWorld2 curating and combining photography with poetry and very short flash fiction – a fun counterbalance to my other work. Work, play, work, work, hope. give in to the words. Work, work, play, no sleep. work play it my way. A big thank you to Rosie and Zelda at Elbow Room and the very best to my fellow writers, artists, creatives between the Elbow Roompages/blogposts! With Elbow Room coming to an end, and the final volume and live night fast approaching on Nov 3rd we are handing over the blog to our contributors. Over the next few weeks past contributors will share their thoughts and stories since they appeared in Elbow Room. First up- Claire Booker who will be taking to the Elbow Room stage for the final live night! Endings so often send us hurtling back to beginnings. I’m proud to have sneaked (almost from the off) into Volume Two, alongside poets Jonathan Butcher and Harry Man and artists Maren Reese and Jayne Smith. That was 2012, and ElbowRoom Live was one of my first feature slots. Camden Town’s hip InSpiral café was the venue during a cats & dogs night of rain. Scuttled umbrellas rubbed spokes with organic smoothies and jazz cello, some great poetry and the awesome band Mina’s Ghost. The volume was a sell-out. Four year’s later, I found myself in ElbowRoom’s orbit again. This time with a poem in their very first Broadsheet (a paper-folder’s joy), alongside such poets as Richie McCaffery, Jason Jackson, Nikki Robson and Wes Lee. Another ElbowRoom Live, this time at the Harrison, King’s Cross, where my fellow features included Stephen Bone, Louise Buxton, Andrew Wells and some wonderful singing and technical bravado by Andrea Kempson. And now, by good fortune, one of my poems is popping up in the final Volume. Over those seven years, I’ve explored my poetic voice, featured at venues across the UK, had a pamphlet published (Later There Will Be Postcards with Green Bottle Press) and appeared in a wide range of publications, including Ambit, Magma, Rialto and The Spectator. One of my poems has been set to music and performed at the Actor’s Church, Covent Garden, and I’ve even had a poem published on a Guernsey bus! Best of all, I’ve met some great people. ElbowRoom’s curators can justifiably be proud of their twenty wonderful volumes, the ethos of the project and their fabulous live nights. So a big thank you and congratulations to Rosie Sherwood and Zelda Chappel. One small step, perhaps, but a giant leap of talent and imagination that will continue to make ripples for years to come. Well, what can I say... Lost in a Dream is out in the world after an exceptional exhibition and week of gigs in London. The book, books really as there are two versions, are real after years of hard work and I am incredibly proud of them. They capture something special about this slice of the London folk scene, and the event in London helped to bring that to life. For those who made it down to The Harrison to support us, thank you! There are videos and a live compilation album mixed by Tom coming soon for everyone to enjoy, I know I plan to listen to it all on repeat when it is ready! When I asked Tom if he wanted to come and make a book with me I was asking a musician whose music I had fallen in love with. I had no idea where the book would end up or that I would gain a close friend in the process. I would like to thank Tom for saying yes, and for throwing himself into the project the way he did. It was and is an honour and a pleasure to have made this book with him. I would also like to echo something Tom said in his email newsletter yesterday, something that is central to the book itself... If the book and event showed me anything it is that music scenes are incredible and fragile things made better and stronger when people come together, work together and support each other. I found myself a part of this amazing music scene in London largely by accident. Elbow Room Live nights gave me the opportunity to invite the talented musicians I kept meeting at gigs to perform. I feel blessed to have stumbled upon this scene as a fan and promoter. The musicians and other promoters welcomed me and Elbow Room onto the scene and the last few years of living and making work in London were made incredibly special by being a part of this world. Lost in a Dream is a beautiful book with an important message. If you want to know more about it check out the project page HERE and sign up to Toms MAILING LIST to keep up to date with the compilation album. In October I announced our newest collaborative artists book, ‘Lost in a Dream’ by Tom Hyatt. Since then we have been working hard to bring this multi-disciplinary art project to life. ‘Lost in a Dream’ explores the temporary nature of music scenes and the transient artists that embody them. • an exhibition of unseen portrait photographs, featuring the stars of London's grassroots music scene. Shot in the basement of the Harrison, the prints will fade to black throughout the week as we get increasingly lost in a dream. • nightly performances from the artists in the frames, see below for the full running order. The concentration of talent here is absurd, with artists flying in from France and Spain for one-off performances. • a chance to see and buy copies of unique artist's books, published and created by boutique publishers As Yet Untitled. Also available to order are darkroom prints of the portraits (see the crowdfunder to order yours now). • to be present at a live musical recording, for release in the summer, to round off this complete capturing of a music scene in London, in 2018. The line up is one of the best you will ever find in one venue, in one week in London. You don’t want to miss it! If you have a moment and are interested in the project please take a look at our crowd funding page. You can pre-order a copy of the book, a print, or the download by pledge to the crowd funding campaign! http://igg.me/at/liad I hope to see some of you at The Harrison, and a huge thank you in advance to anyone who chooses to give a copy of the book a new home! To celebrate World Book Day (and Snow Day here in the UK) I thought I would share a never before seen photo of The Ellentree taken many years ago. I hope you have all found time to curl up somewhere warm and comfy with a good book today. This year has been one of celebration for Elbow Room. It was our fifth birthday, and you all helped us celebrated with style. September was the release of our 18th volume and our last Elbow Room Live of the year. One more year of sharing art in all guises. One year to say goodbye to Elbow Room. It is with this in mind that I open submissions for volumes 19 and 20. If you have ever wanted to submit to Elbow Room before, now is the time. If you have submitted before but always wanted to again, now is the time. Submissions will be accepted until midnight GMT on January 31st and the full guidelines are HERE. 2018 is going to be an amazing final year and your work is going to be the highlight. I cannot wait to see it. As Yet Untitled is thrilled to announce our next collaborative book. I’ve been keeping it a secret for months but the time is finally right to reveal that As Yet Untitled is collaborating with musician Tom Hyatt on the creation of our next title. I met Tom years ago and since then he has become something of a regular with As Yet Untitled. He has taken to the Elbow Room stage multiple times and played at the launch of Moonrise. It was at one of these events that I approached him about making a book together. His music is incredible and I fell in love with it the first time I heard it. When I had the idea of collaborating with a musician on the creation of an artists’ book Tom immediately came to mind. His lyrics are so visual and so evocative that I knew anything we made together would be exciting and unusual. So far, even in these very early stages, this project is proving me right. And so, it is with great joy and pleasure that I announce Lost in a Dream. After many conversations and much planning between Tom and I we have found ourselves (in true As Yet Untitled fashion and keeping with our ethos to create artists book that go beyond expectations of the book form) spearheading a project that is more than a limited edition book; a project that truly reflects the multifaceted nature and potential of book art, photography and music. Lost in a Dream will celebrate the works of musicians whilst emphasising the transitory nature of their existence, and the scenes in which they operate. Incredibly, almost unbelievably, Elbow Room is 5 years old this year. The very first volume, made on my Mums dining room table, was released in 2012. According to the online settings on my twitter account I joined on April 12, 2012 at 11:39 am. That’s the earliest Elbow Room date I have an official record of. And its feels right that it should be, with so much of this journey playing out of social media. We stand now, 5 years, 16 volumes, three UEA special editions, two competitions and well over a hundred published writers and artists later and I find it all hard to fathom. Elbow Room has changed my the landscape of life, I’ve met incredible people, made amazing friends, been to book fairs, done things I never dreamt I would have the strength, courage or ability to do. In the introduction to the first volume I wrote about coming across a hand painted sign for a bookshop so tiny it only had space for a desk and one over flowing bookcase. This was the birth of Elbow Room and is a story I tell quite regularly. Despite the size of the shop they had divided the shelves into fiction, poetry, illustration, photography etc. I found myself frustrated that art, visual and written, is not allowed to sit together more regularly. I decided to create something that celebrates art in all guises. All the contact information, the website details and email in this first volume are now completely out of date, but this core idea, this ethos still runs strong through everything Elbow Room does. Elbow Room went out into the world on April 17th 2012 with our first offering a track from the ever Incredible Late Arrivals Club, a band that would become regulars online and off on Elbow Room stages around London and Norwich. On April 19th 2012 a hunt for paper began and Zelda and I had our first contact. Little did I know then how integral connection would become to every aspect of Elbow Room. For months I tested papers and played with layout design until on the 25th of August 2012 Vol. One was released. From the first to the 16th (and beyond) I am immensely proud of every volumes of Elbow Room we have produced. Proud of every live night, every exhibition, every conversation we have had. I want to thank you all, from contributors to performers to readers. Without you none of this would be possible. So, now for the fun it! We have decided to celebrate turning 5 by having a picnic on Telegraph Hill on July 15th from 3pm. Full details can be found on our Facebook page HERE! We are also making a special something (obviously) so watch this space and we will tell you more soon. We have another little birthday celebratory treat for you all. Here is Ella reading Cold Stone. Moonrise was written between 2014 and early 2016, and it catalogued my life in London during that time, north of the river in Hackney and South of the river in Stockwell. The centrefold poem, Donald Trump vs my childhood joy was written before Trump was even elected as a nominee for the Republican Party, let alone before the nightmare reality of him being President of the United States of America. Around a month after publication, the citizens of Britain voted to leave the European Union. Essentially, then, this collection was written in a youthful bubble of a vivid present that I partly believed at the time would continue forever, a present that found me excited, enamoured with life in all the ways it's possible to be, prolifically creative, and in love. I find myself a year later, moving to Crystal Palace, seeking relative calm and breathable air, from the "G-grade, 2V ball of loud light and fear" that is central London. I've never been very good at stemming my own misplaced nostalgia, but the moments reported in Moonrise included some of the grandest moments of my life so far: becoming financially independent for the first time, twice daily crossing the Millennium bridge between St Paul's and Shakespeare's globe to my dream job, standing in a midnight pool of meadow scent and supermoon light, dancing in the moat of an ancient Serbian fort with my best friend, ending my longest and most serious relationship. All these moments are real, but their retellings in poems makes them unreal, too. That's something I've learnt. The moments become enormous, branching and flowering and becoming strangled by ivy and bindweed of other ideas and memories and new associations. I guess what I'm trying to say is: thank you so much for your support and for your time if you have read Moonrise. It means a heck of a lot to me. Sometimes I worry that I am being misunderstood, or that I have written the wrong types of things. But, if anything, reflecting on Moonrise has made me realise that poetry can be an antidote to nostalgia. It is honest, always. It rarely resists pulling the punches. Among the numbness, the sexual assault on dance floors, the latent knowledge of fascism and rage rippling below the apparent civilisation we live in, there were childhood memories, the friendships so strong they make your eyes water, the flowers, and the calm moon in the sky who rises despite everything. The Future of Book Publishing. I couple of weeks ago I was asked to give a 10 minute presentation on the future of book publishing. As Yet Untitled, what we make, the people we work with and our audience were the inspiration behind my every word and so i wanted to share it with you all. The future of book publishing is limited only by our imaginations. As a creative industry its place in the world depends upon our ideas, questions, visions and experiments. Throughout the history of the industry technological advancements, from movable type through mass paperback publishing to the e-book have triggered conversations and fears about the future of book publishing. Just one example of this was the conviction from mainstream publishing that Allen Lane (Quote) “messing about, would bring the whole structure of British publishing tumbling into ruins”, as Desmond Flower remembered in 1960. These conversations became particularly prevalent once again among academics, journalists, readers and industry professionals alike with the most recent of these advancements, the affordable e-reader. Articles were written and conferences held as experts put forward their opinions on the future of our industry. Many of these opinions expressed the belief that e-books were a death knell for paper book publishing and perhaps even the industry at large. I read the articles and I attended the conferences and I quickly became bored. As I looked around I came to a realization. This conversation wasn’t new, the fear wasn’t new and neither were the sole property of the publishing industry. When photography was first invented people said it would be the death of painting. Instead painting from freed from the literal, and we got impressionism, cubism and abstract expressionism. When digital photography was invented people said it would be the end of film. Yet film photography is still here, holding strong and interest is even increasing once more as students and professionals turn back to it for that unique something it offers. The music industry has undergone sweeping changes over the last decade. Yet last year vinyl sales reached a 25-year high and in November even outstripped digital downloads. What came before is not always swept away by what’s new. Instead they can free each other, co-exist, intermingle and provide creators with more tools than ever before. I come to publishing as an artist, with an arts education and an artists’ eye. As a sculptor I work with bronze and wax. As a photographer I have stuck steadfastly to film. As a publisher I hand-bind every book I make. Yet this year I proposed using 3D laser cutting to create a sculpture that was recently long listed for the National Sculpture Prize. I scan and digitally finish all my photographs and every book I publish is designed on InDesign. Because why wouldn’t I? Why not use every tool at my disposal to realize what I am imagining. As a book artist every aspect of the books design is integral to the creation and expression of meaning. If you make a book that fits into the palm of your hand, with thin delicate pages, it immediately seems precious and jewel like. If you make a book that’s 6 foot tall it is immediately overwhelming and awkward. If the book is unbound, with loose-leaf pages, it spirals out, able to shift unendingly. Before your audience has even gotten to the content they have started imagining what the book is about. As an artist and publisher it is important to me that my own books look and feel right, that the paper choice and the typeface convey meaning to the eye and to the hand. When we read we read more than the words on a page, we read the object. We read with our hands, with our expectations, and with our imagination. I believe it is our job as publishers to enliven as many senses as we can in our mission to engage with our audience. Whether this is achieved through swiping or turning a page, through augmented reality or traditional cloth cover binding and end paper doesn’t matter. All of these things have a home in the future of publishing. We face an audience today that is inundated by choice, by self-published books, new imprints, new magazines and endless online publications. But we also have an audience that is, as far as I can see, more aware and more engaged with books than ever before. The same people that are buying vinyl and using film are buying book art, supporting independent publishers and frequenting bookshops. They have an appreciation and thirst for the object, its beauty, its variety and its potential. The responsibility of engaging this growing appreciation is in the hands of the publishing industry. It is up to us to give ALL books the attention they deserve. It could be producing beautiful editions like Erin Morgenstern’s Night Circus (published by Harvill Secker) of Katie Holten’s About Trees (from Broken Damanche Press). And it could be by experimenting with how the books design can affect narrative as with all of Visual Editions catalogue. However we go about it engaging with this growing and discerning audience can only lead somewhere exciting as they demand more from the industry and we ask for more from them. I look around at small publishers fairs and I see poetry collections, photo-books, humorous pieces about installation proposals that will never make it to the turbine hall at Tate and illustrated pop up books beyond the wildest imaginings of my childhood. I go to conferences and I hear talks on books about water pollution where the paper is made using water from the very same river the book is about, I hear talks on screen printing, on archives, on live publishing and books that change, coming alive with a simple app. I frequent crowd funding websites like Kickstarter and Patreon, supporting my contemporaries and embracing the idea of the public as arts patron, commissioning editor, test audience and gatekeepers all rolled into one. I go to artists’ book fairs and I have conversations with librarians, private collectors and the public about their responses to the sculptural or limited edition, handmade, etched, risograph or digitally printed books before them. I go to bookshops and search through novels, comics, and non-fiction in the hopes of finding words that will transport me somewhere new. I do all this and I find myself thrilled, excited, even jubilant about the future of the book publishing. Whatever the book, whoever published and however they made it the ideal result is the same. We want books to express ideas, ask questions, offer answers and tell stories. One of my favorite theorists Roland Barthes states in an essay that, “The narratives of the world are numberless…” For the publishing industry to remain not only relevant but cutting edge we must find, invent and embrace as many forms of Bookness as there are narratives. Leading the charge in this are the students, the artists, the designers and the indie publishers. The readers who don’t take the book for granted. The mainstream publisher whose cover design stops you in your tracks. Those willing and able to take risks and make glorious mistakes. Those who work tirelessly to make something new, to revive something old, to reach out and engage their own and others imaginations. It is here that the future is found. The future is those people that are driven to explore. Those for whom books mean something special, who will let their imaginations run wild and exist without limit. And it is in limitless imagination that the future of book publishing finds fertile ground. It is with that in mind that we at As Yet Untitled are launching our holiday season special… Blind Date with Books. The idea is a simple one: you choose how much you want to spend and we send you one or collection of our books whose value equal what you’ve spent. We will wrap them beautifully for you and send them anywhere you want. The fun part is that you don’t pick which book, we choose for you and we keep it a secret! All our titles, from Elbow Room to Moonrise and The Ellentree are included. So why not get a surprise for yourself or give a handmade book to someone you love. Earlier this autumn, before the dark mornings and early sunsets, a review of The Ellentree was published in the Book Arts Newsletter. Observant visitors to the Turn the Page Artists’ Book Fair in the Forum in Norwich may have spied a curious tree occupying the airy expanse beneath the atrium roof; copper-tendrilled, with a host of bright and fluttering leaves which, on closer inspection, would be revealed as delicate origami cranes. This was the ‘Ellentree’, a mysterious presence at the heart of book artist Rosie Sherwood’s book of the same name. The Ellentree is a short fantasy story told through text and image which follows the enigmatic character Evelyn on his quest to find the tree. The quietly compelling poetry is interwoven with stunning photographs of the ‘Ellentree’ and its vivid leaves in a series of natural landscapes, which seem at once familiar and otherworldly. This duality of vision – of words and image – is explored throughout the book, which raises questions about perception, reality, memory and forms of knowing. There is a shifting, even unsettling, quality to the story; ultimately, no answers are provided to the subjects it raises, indeed, the work does well to resist any easy conclusions by finishing with a question. As a physical object, the book is beautiful to look at but also to handle. Minute attention has been given to detail; from the subtle variations in the font and the precise weight of the paper to the thoughtful use of blank space and the bright darts of multi-coloured thread which weave through the spine and pages. ‘If “Seeing is Believing” ’ (to quote a line from the book) then The Ellentree certainly warrants more than a glancing look. We would like to offer huge thanks to Eleanor for her thoughtful words and for taking the time to review our book.